Built: 1924, Cincinnati Car Co. The Chicago Rapid Transit 4000-series cars have interesting interiors with old-time light fixtures, walkover leatherette seats and "bowling alley" seating at the ends. 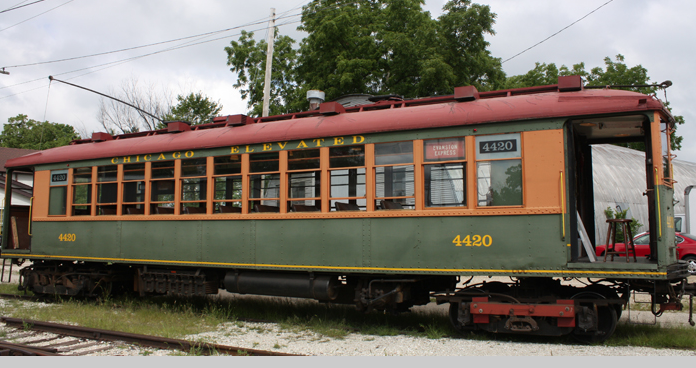 They help demonstrate both the interiors typical of the height of the interurban era, and the exterior of the coming state-of-the-art steel cars. Being high-level-loading cars, they have no steps and must load at either of the railroad’s two high-level platforms or at a special stairset. They feature early automatic acceleration technology, with controller points for switching, series, parallel, and field shunt, without the resistance points of the older cars, a precursor of the PCC control scheme to come in the Thirties.